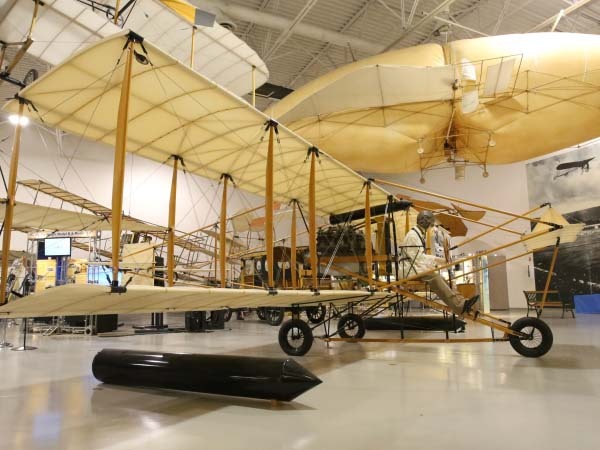 Many aviation firsts took place in early northern California. None may have had more impact than Eugene Ely’s epic landing on the heavy cruiser U.S.S. Pennsylvania in his Curtiss Pusher. Ely’s Curtiss model “D-IV” pusher aeroplane was equipped with metal hooks set to catch any of the 22 ropes stretched across the 120 foot long platform erected on the ship. The ropes were weighted taut with 50 pound sandbags. Upon his landing, this simple setup successfully snagged the ropes, arresting the aircraft ten feet short of the ship’s superstructure. After having lunch with the captain, Ely turned the Curtiss around and flew back to Tanforan Airfield west of the more recent San Francisco International Airport. His historic accomplishment was hailed by the Pennsylvania’scaptain and documented by the San Francisco Examiner newspaper. 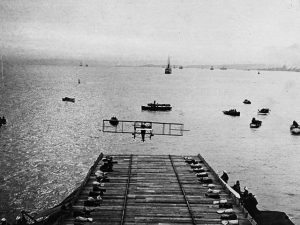 Naval carrier aviation was born of this event in San Francisco harbor, on January 18,1911. Ely, a Curtiss factory pilot, showed that ships could be used as floating airfields.